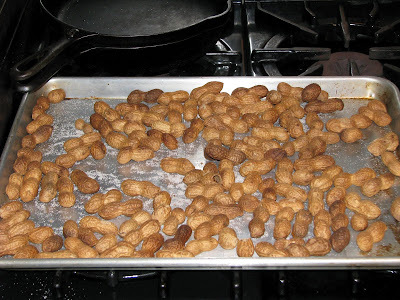 Have you ever had freshly roasted peanuts? They are a treat. 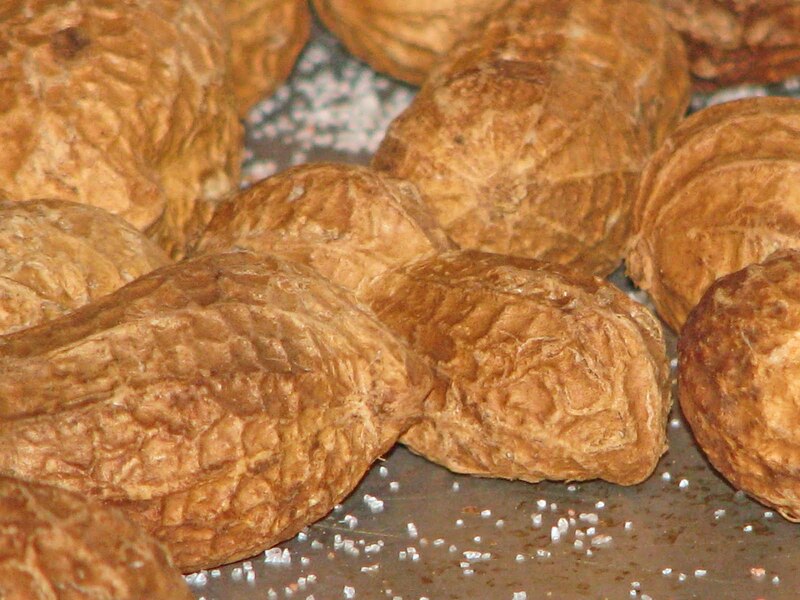 Roasting nuts creates a more intense, warm nutty flavor. Browsing the Richmond Farmers Market we found some raw peanuts. These peanuts were fresh and a little damp. 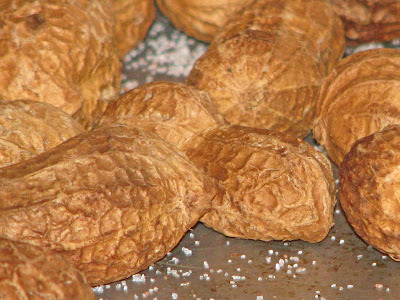 The farmer suggested letting the peanuts air dry for several days before roasting. We purchased a pound for two dollars and set them out on a newspaper to dry. Several days later the dampness was gone and it was time to roast. The nuts still in their shell were place on a baking sheet. They were placed in a 350 degree oven for approximately 20 minutes. The last 5 minutes you need to check your nuts to avoid over roasting. Sprinkle with salt while still hot. These peanuts were addicting. 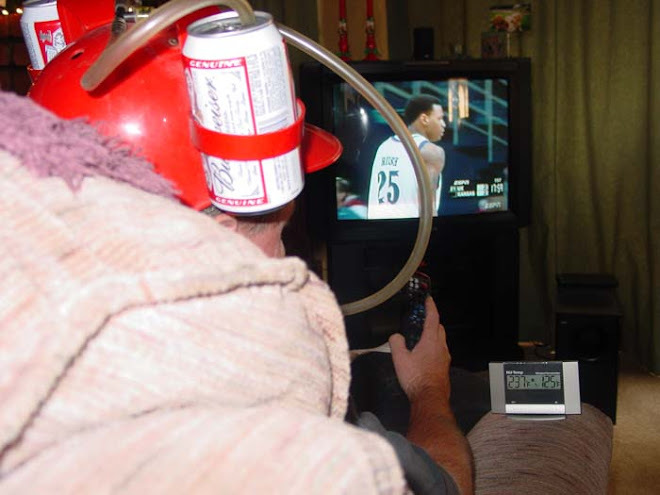 Give me a cold one and 'Take me out to the Ballgame"
Today’s post is ‘Pink Slime’ free. Pink slime has been in the news lately. Is this a Nickelodeon children’s prop or a threat to our food safety? What is pink slime? Unappetizing beef scraps, cartilage and chemically altered meat. (Ammonium hydroxide) that is mixed into so called hamburger meat has fueled this recent phenom event. 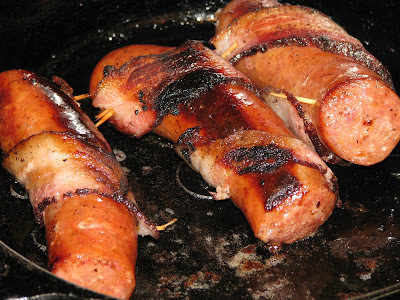 We have a meat source that is pink slime free from Angelo’s Meat’s in Petaluma California. Now Angelo is a good friend who is a character that is larger and crazier than this recent scandal. We love to visit Angelo because he usually feeds us and lifts our spirits to a higher level. Angelo was in the back smoking turkeys and bacon. We greeted him and started our smiles and laughing fest. 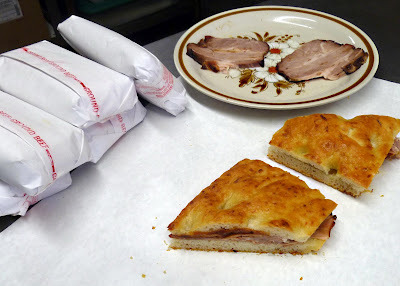 Fresh home made, best ever foccacia bread and smoked pork sandwiches was our reward today. As we were eating our sandwiches Angelo told us about his hamburger. Happy cows and slime free at 3/99/pound was all we needed to know. Hanging out with Angelo is an adventure. While we were there he received a crank call from a sexually frustrated woman that Angelo broadcasted on the speaker phone. Angelo handled this call with grace and we had some giggles. We filled up a small ice chest with hamburger and other treats and said our good byes. 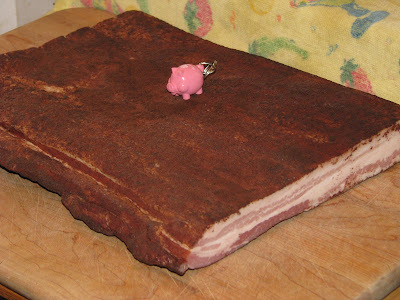 Pink Slime be damned! 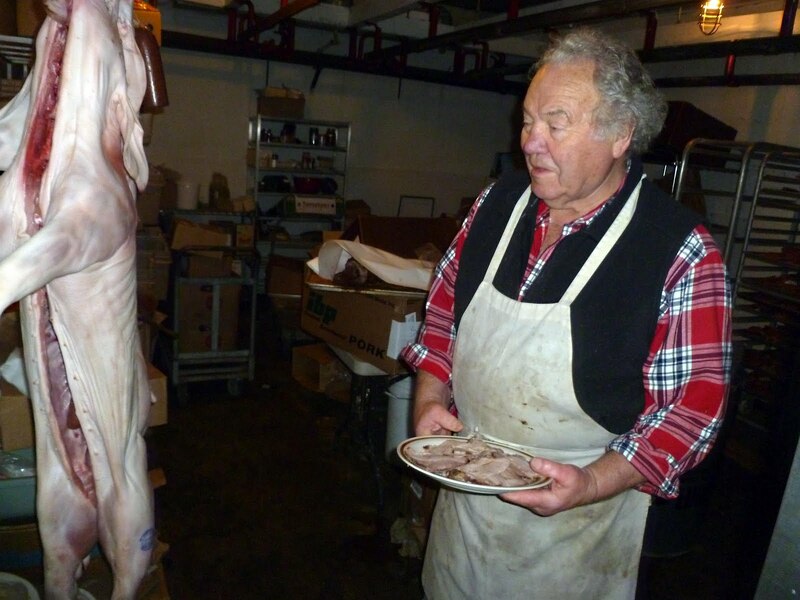 Some professor created a scandal that will change the meat industry for hopefully the better. Angelo is a local butcher that has real hamburger meat that is slime free. Support butchers like Angelo and the World will be a better place. We have already ordered our Easter ham from Angelo. See you soon. 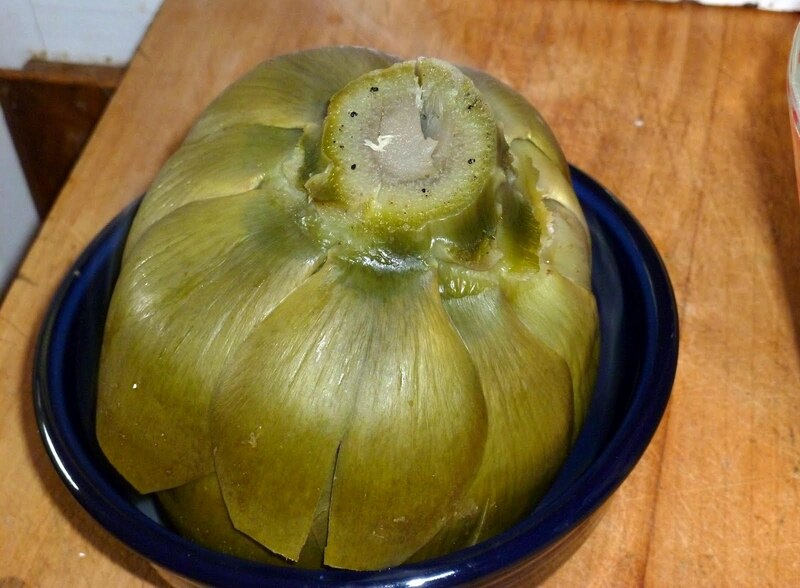 Today is National Artichoke Heart Day. Steamed, boiled, fried, barbequed, and even raw they are delicious. Let's allt have an artichoke heart to celebrate the day!! It is that time of year to break out your shillelaghs and have a green beer. My green beer swilling days are over (Beer is just not green) but I do love corned beef. Today we are soaking a brisket with water, salt, sugar and spices. 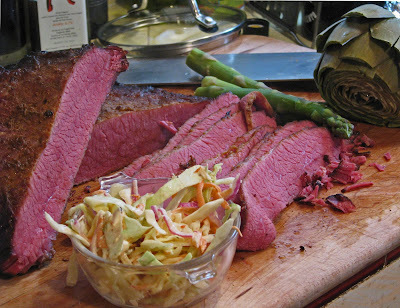 Five days in this marinade and we will have a raw corned beef just in time for St Patrick’s Day. This beautiful hunk of choice grade beef was acquired at a restaurant supply store. Its initial weight was 16 pounds but after trimming and removing the point end, a good nine pounds remained. 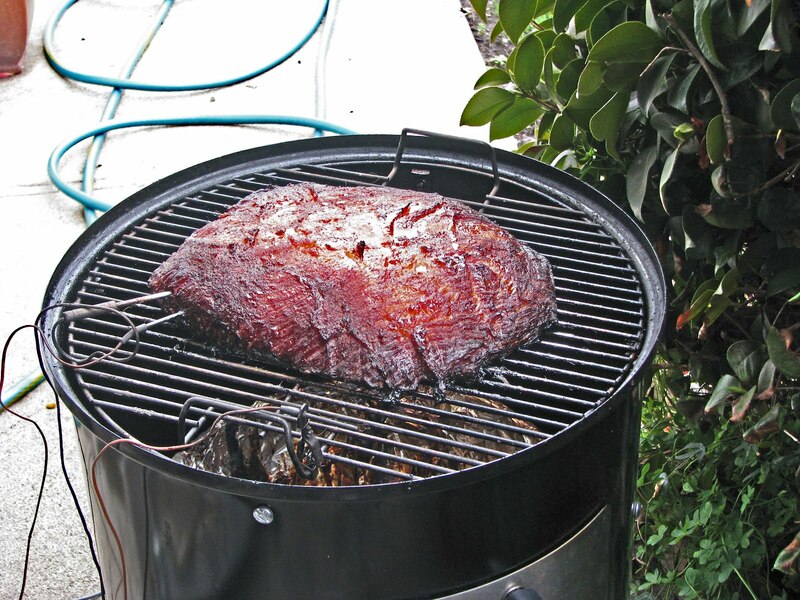 The point end will become burnt ends later this evening. Here is the brine that I am using. In a large pot bring water to a boil and add ingredients. Stir until dissolved and turn off heat. Cool brine. 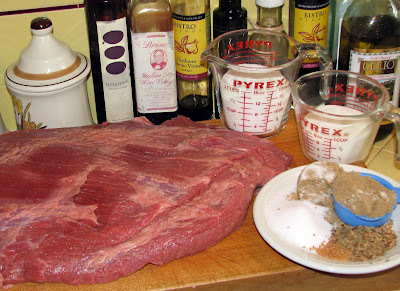 Place brine and brisket into food grade bucket or large pot. 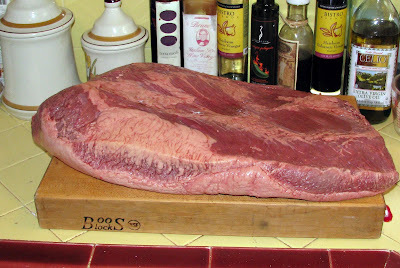 Weigh down brisket so it is entirely submerged. 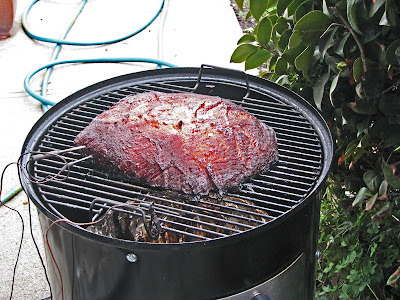 Turn brisket daily for five days. 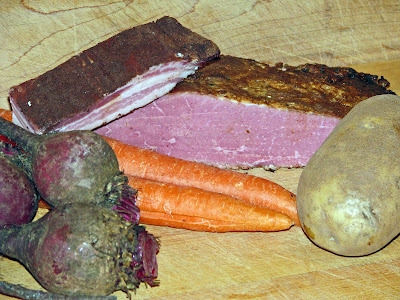 We will return later this week and cook our home cured corned beef. “Zoomie Station, Friendship, Sourdough and Best Bread Ever’ are several names that we can call our bread tonight. 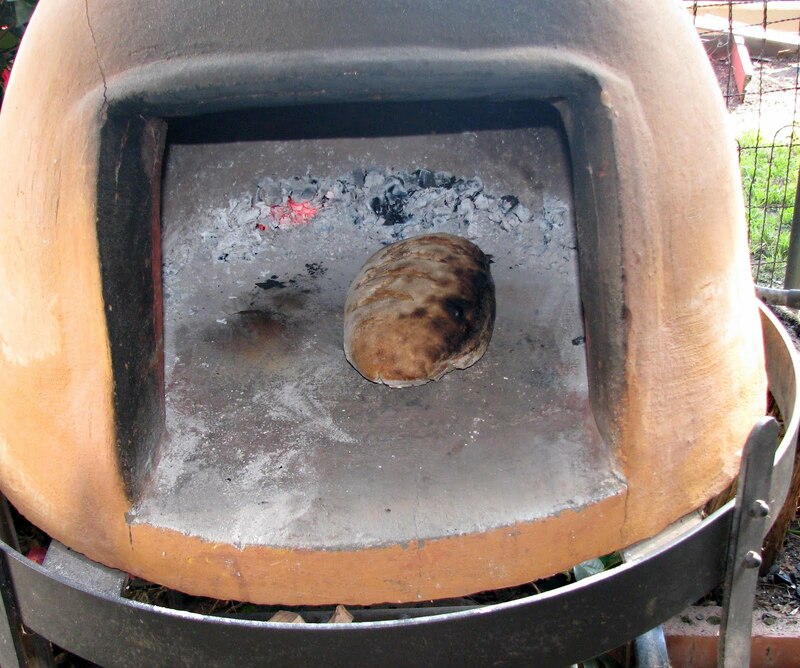 This bread was made from a wild yeast that is passed down from generation to generation. 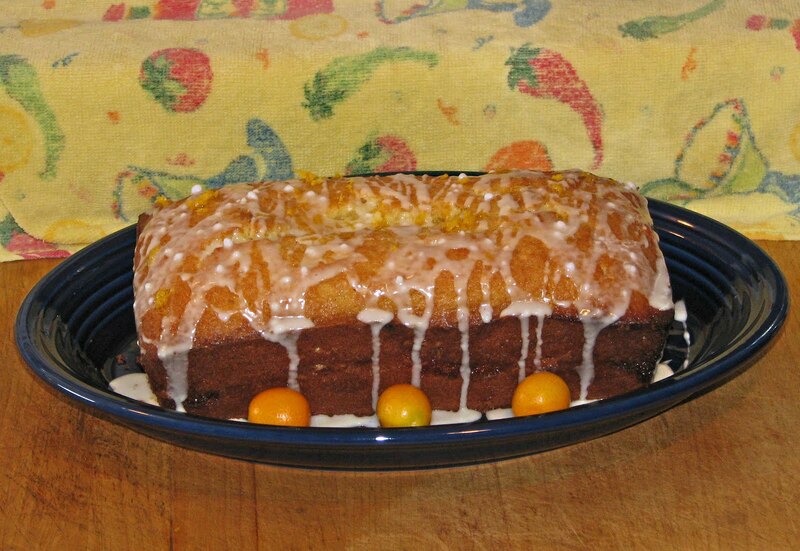 The Amish call it “Friendship Bread’, because you would pass the yeast to your neighbors. This yeast was contained in a flour and water mixture. 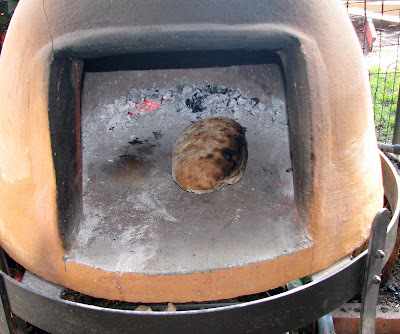 The “Gold Miner’s” of California had a similar yeast concoction and called it sourdough. Today Zoomie of Zoomie Station gave us a small container of flour and water with live yeast. 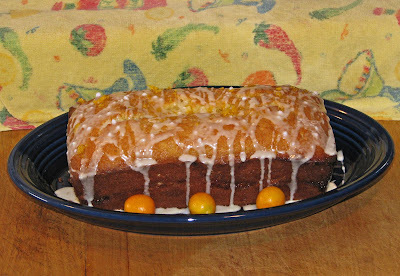 With the addition of sugar, salt, water and flour, it will be transformed into a loaf of fine bread. What is great about this starter is that is a living and breathing organism. You need to feed your starter occasionally. With proper care this yeast will live forever. I would like to share this starter with you. Drop me a line and for the price of postage I will send you some. Instructions will be included. See you next time. 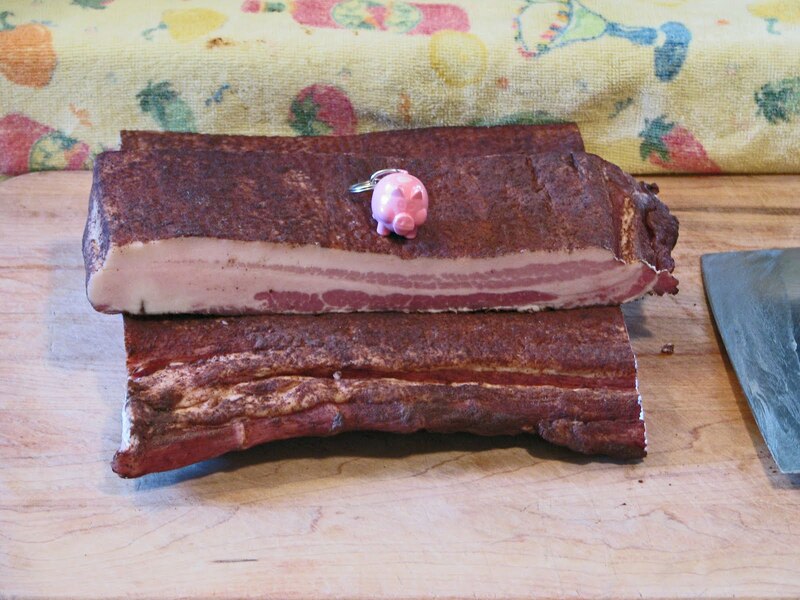 Bacon Revue will sweep the stage and polish the spotlights to present this spicy cured bacon. We are sauntering across the field, 'moo'ing' across the tundra, and grazing across the stage of pork belly delights. Manas Ranch has cured and smoked some pork belly's with a certain spice for this entertainment extravaganza tonight. Smoked Dakota sausage wrapped in bacon sounds like a winner in our test kitchen. 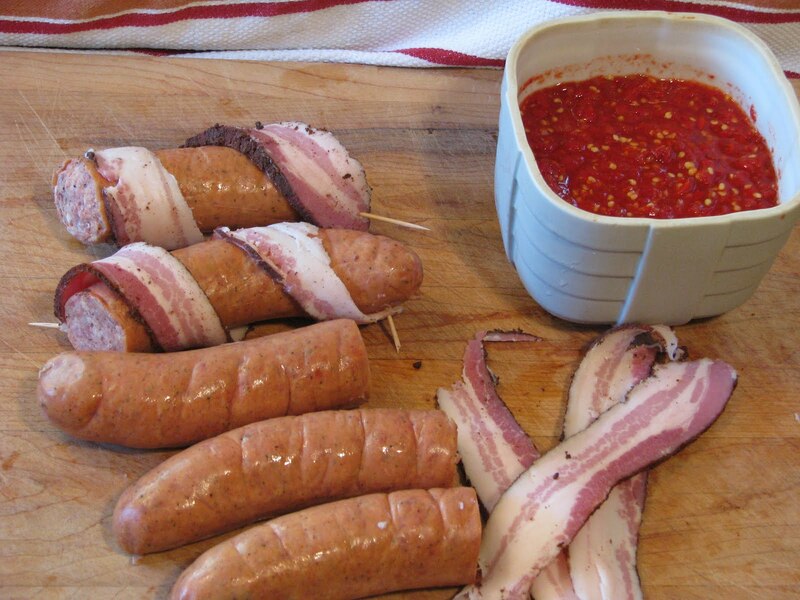 A few toothpicks will secure these meat wrapped tubes of love. They will be blessed on the cast iron vessel of bacon rendering Does the house smell like bacon heaven? 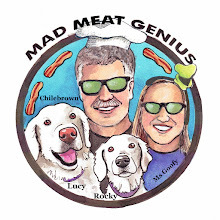 Oscar, Lucy and Ms. Goofy are dancing tail spins of anticipation for bacon/cinnamon greatness? It smells like a Holiday breakfast treat. The combination of bacon fumes and cinnamon are like catnip to us. Lucy and I are rolling around the floor waiting for diner until Ms. Goofy told us to knock it off. Bacon with Cinnamon sounds a little different and it is. When the bacon renders it fat and starts to heat the cinnamon magical moments will occur. The smell will overtake your cooking area. 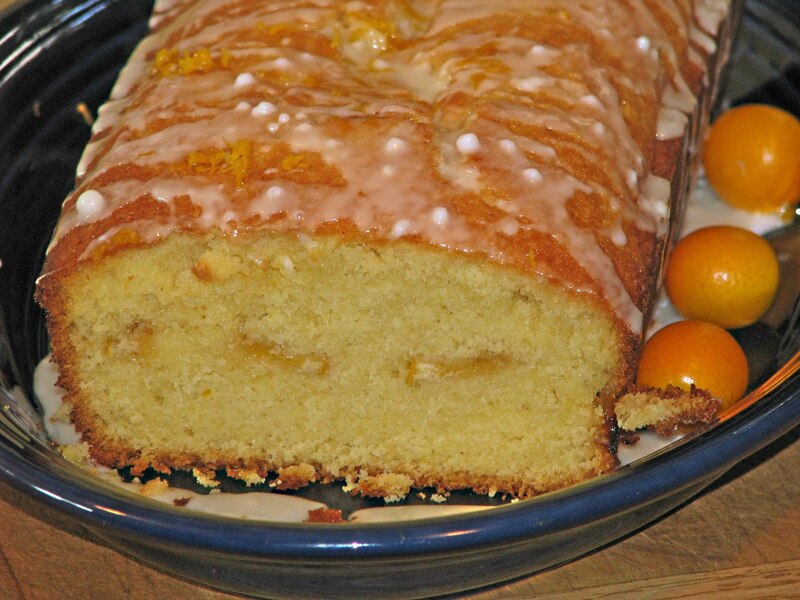 This is a comforting smell that brings taste bud memories of waffles, pancakes and cookies. Today's bacon from Manas Ranch will receive 3.5 stars out of five. This is good looking bacon with it cinnamon crust. It fries up crisp with a smell that may be worth the price of admission. 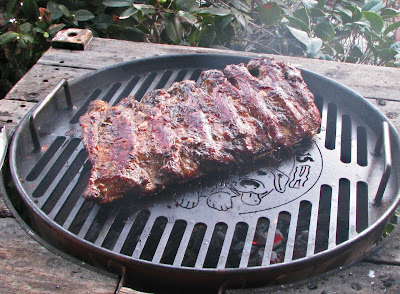 The slab may be hickory smoked but does not show up in the final product. 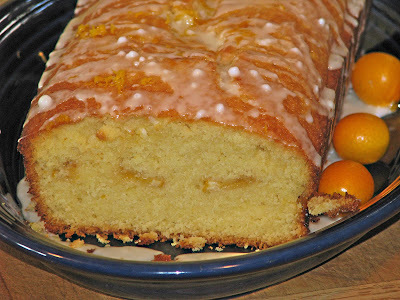 The salt and brown sugar has a great balance. This is some over the top great breakfast bacon with a cinnamon twist. As we fueled the Racing Honda the price of gas rose another 25 cents. This was only a slight glitch on our latest ‘Meat Adventure’ to Esparato, California. 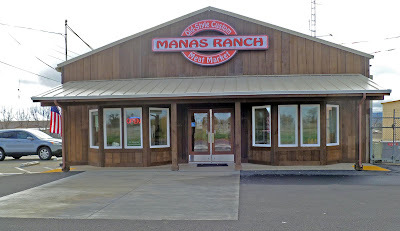 We were on a mission to visit ‘Manas Ranch Old Style Custom Meat Market’. This is a retail store that sells beef that is raised on the “Double Bar O Angus Ranch’. The Double Bar is owned by Fred & Alice Manas hence the name of the retail store. The cattle are pasture raised in the summer. They are grain fed later in their calm and stress free environment. The beef is processed and sold at farmers markets and the retail store. Manas Ranch meat market is about an hours drive from the Abode. A rural area with lots of farmland and pasture surround this store. 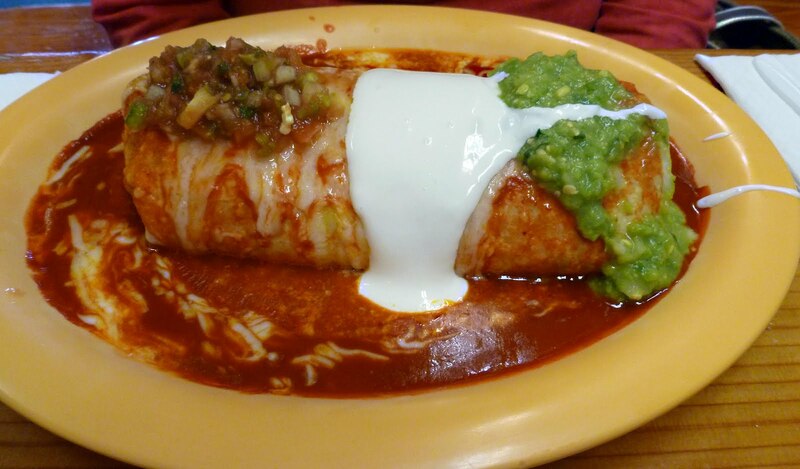 It is conveniently located a mile off the interstate. Once inside a small, bright, clean and modern meat counter greets you. House made sausage, marinated meats, beef; pork and lamb were displayed for purchase. Manas Ranch philosophy is to sell local humanely raised meat products. Two of the largest T-bones in the display case shouted out to us. We had done our homework and had pre-ordered some house cured slab bacon. Bacon is for sale but will be sliced. We talked to several helpful employees and learned about the ranch. 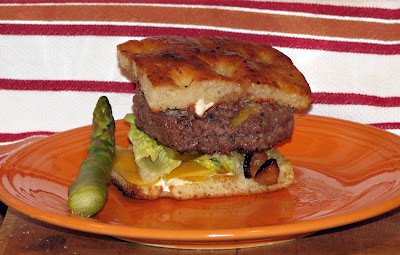 Our meat server suggested trying the grass-fed hamburger. (Grain finished). We filled up an ice chest with our bounty and returned home before the price of gas rises again. 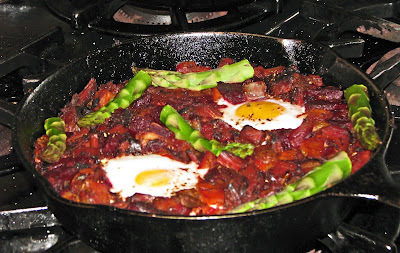 Oh my, the bacon is so ****; story later. Today, a couple of barbequed burgers will be the sample of our meat acquisitions. Salt & Pepper was the only enhancement for this ground Angus beef. 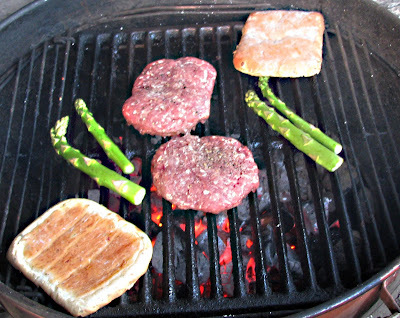 The burgers were cooked over a mesquite fire. Biting into this burger was an out of body experience. I cannot believe how juicy and beefy flavored this meat puck was. The beef was ground a little finer and had almost a sausage like texture. The price of this beef experience was 3.00/pound and is a bargain in our book. We are looking forward to trying the T-bones this weekend. We will share the bacon with you later. 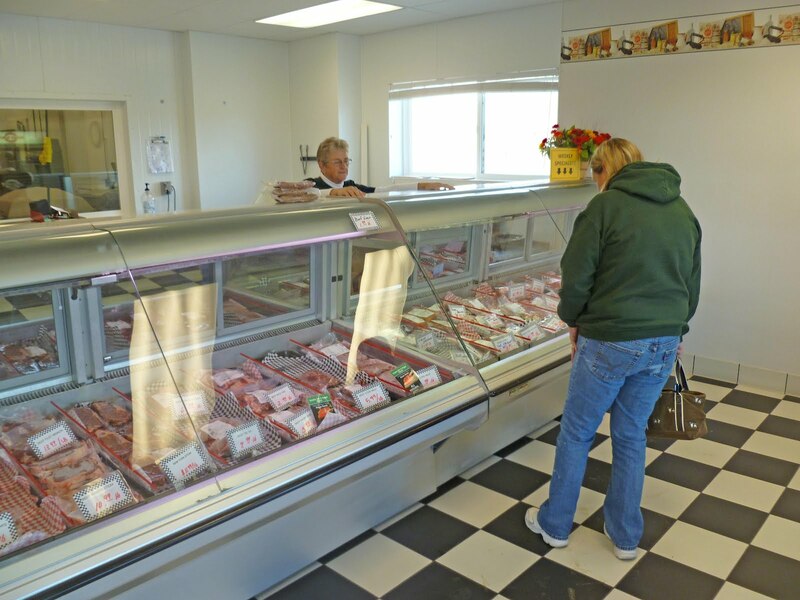 Manas Ranch Old Style Custom Meat Market is a great meat find.